Soul Collective Vol. II Tickets on Sale NOW! We're back! 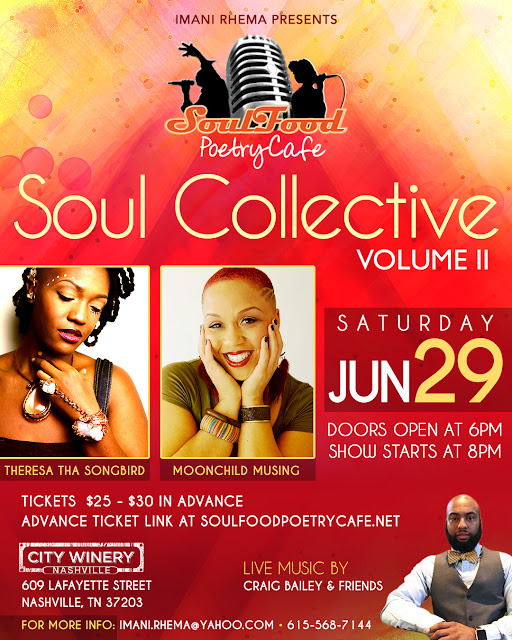 We are gearing up for our next Soul Food Poetry Cafe show and this is one that you DO NOT want to miss! In January we made history - it was our biggest show ever, as we SOUL'D OUT the main venue at the City Winery Nashville IN ADVANCE! And the venue managers say that it was the best show we've had! In fact, people say that the Soul Food Poetry Cafe is what they have been craving from the urban entertainment scene in Nashville! We're proud to present our next event, SOUL COLLECTIVE VOL. II. Saturday June 29th! Save the date - tickets will be on sale soon! 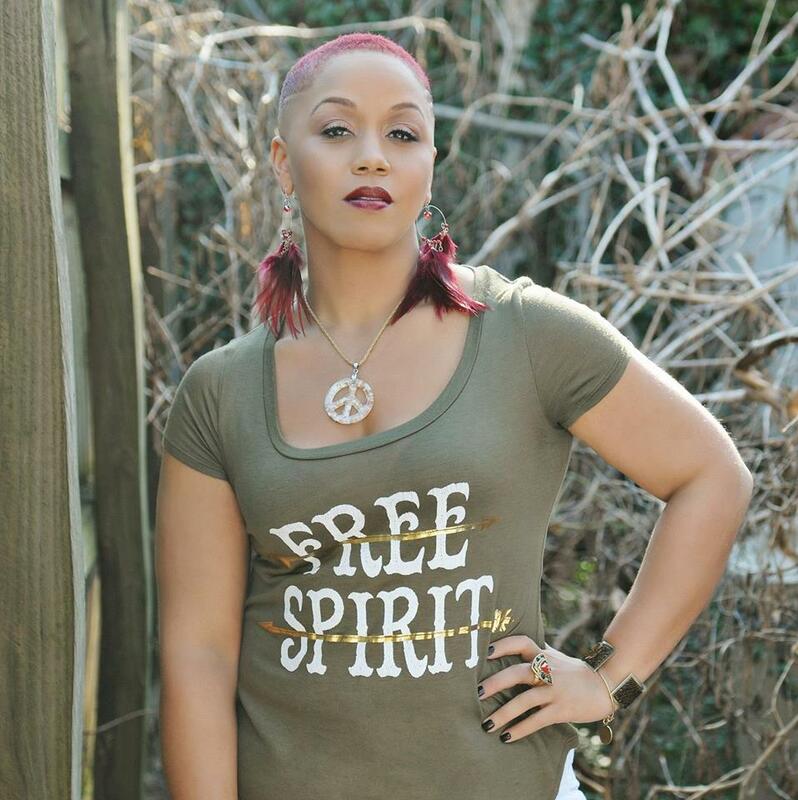 We are bringing the viral sensation Theresa tha SONGBIRD from the ATL as our spoken word feature, and Nashville Predator anthem singer Moonchild Musing will be our featured vocalist! We also will be bringing back the amazing live music experience from Craig Bailey & Friends. If you were there for the surprise ending set at the last show, you may remember the mind-blowing performance from Nick Oldham and Quincie Simone... they will be featuring at our next show! And an audience favorite, Will B. Sings, will definitely be in the building! Musical. Lyrical. Theatrical Alchemist. Sprinkling BLACK GIRL MAGIC and hot sauce on every microphone she touches. Theresa tha SONGBIRD is a supernatural wellspring of entertainment. Hailing from the south suburbs of Chicago and calling Atlanta home, Theresa is dedicated to increasing accessibility of arts and humanities to young people through outreach in school systems across the country as a talent consultant and coach through her company BIRD Media Enterprises. As a spoken word artist and vocalist, she recently had the honor of her poem “You So Black” going viral from her appearance on the 2019 Trumpet Awards on Bounce TV. In addition, she was cast in Season 3 of Verses and Flow on TV One. 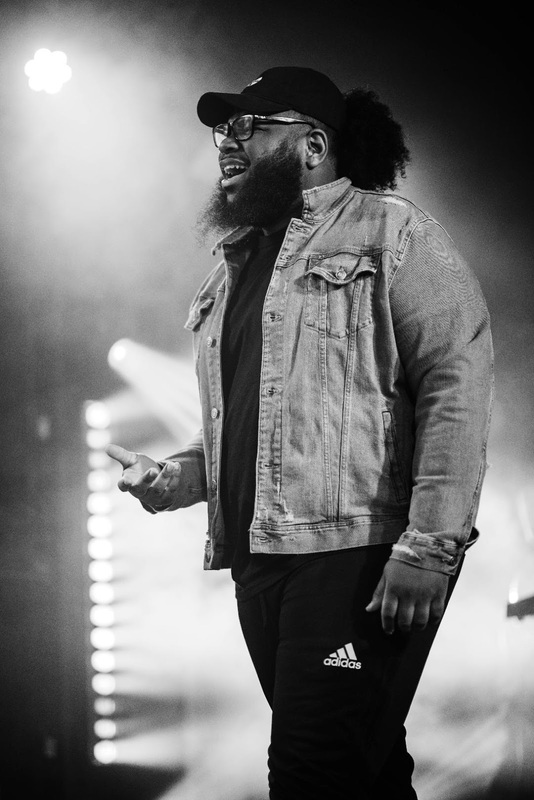 Theresa tha SONGBIRD also recently graced the stage alongside the luminary talents of Jill Scott, Arrested Development, Jasmine Sullivan and Robert Glasper. In 2017, SONGBIRD self-published her first book of poetry, Mass Matter Magic, which is available on Amazon. Singer, songwriter, and social media’s #MoonChildMusing, vocalist Tamica Harris is becoming nationally known for her vocal talents as one of the anthem singers for the Nashville Predators Hockey League. As a native of Nashville, TN, Tamica was immersed in music at a young age. She fell in love with singing at the age of 5 after hearing the incredible voice of Whitney Houston. Her parents were very supportive in developing her musical abilities. Tamica was a student at the W.O. Smith Community Music School which afforded her many opportunities such as performing with Aaron Neville, Shania Twain, and Dolly Parton. 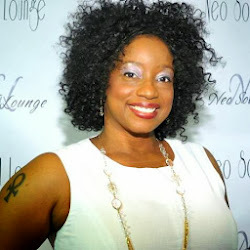 She attended Tennessee State University, receiving a Bachelor of Science degree in Commercial Music, and then went on to Middle Tennessee State University earning her Master of Arts degree in Vocal Performance. 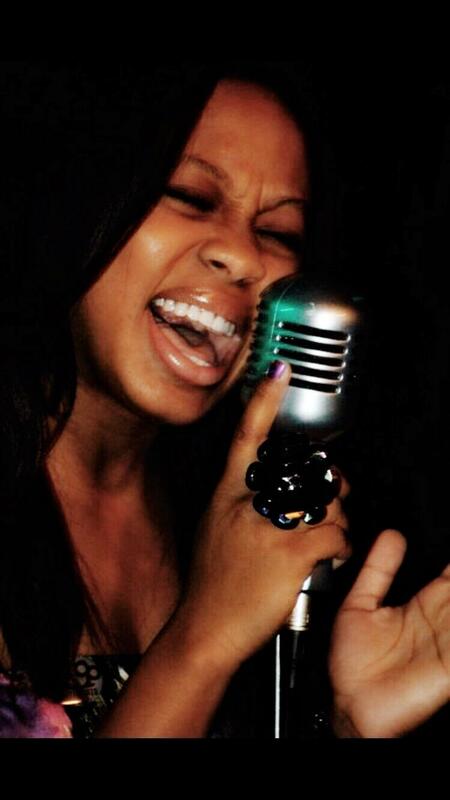 Tamica has graced many stages singing various styles of music. 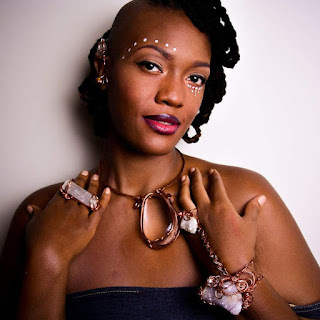 With her passion for opera, jazz and neo-soul in tow, she plans to release an EP soon. When she is not working on music Tamica enjoys spending time with her sons Jerrion and Jaxson. Founded over 12 years ago by Nashville poet Imani Rhema, the Soul Food Poetry Cafe is one of Music City’s longest-running live music and spoken word showcases - featuring some of the most talented artists and vocalists in the community. Join us for Soul Collective Vol. II featuring national spoken word artist Theresa tha SONGBIRD, vocalist Moonchild Musing, and a high-energy live music experience by Craig Bailey & Friends with Nick Oldham, Quincie Simone, Will B. Sings and more! And as always…we have surprise guests under our sleeve! Tickets are on sale now! Get them early...you know how we do! Get Your Tickets Now...Before They're SOUL'D OUT! Hello Nashville Urban Entertainment Lovers! If you are interested in an amazing night on the town, getting dressed to impress, enjoying an exclusive wine collection, having great food, and hearing the very best live music and spoken word in Nashville, do we have the event for you! 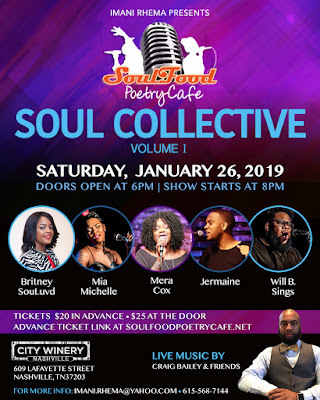 Introducing...Soul Collective Volume 1 - Soul Food Poetry Cafe's 2019 event showcase! Saturday January 26, doors open at 6pm, show starts at 8pm! Live music by Craig Bailey and Friends, poets Tia Pugh, Jeni Calhoun, D'Essence, Frank "Frizzy" Sykes, and featured poet Britney SouLuvd; vocalists Aundria Green, Mera Cox, Jermaine J., Roni Sloss, Will B. Sings, and Mia Michelle... and special surprise guests! Tickets are only $20 in advance, $25 at the door! Get your tickets now - we are expecting a full house! See you there fam! Reach out to Imani Rhema at 615-568-7144 with any questions! Soul Collective Volume I - We have finalized our Artist Lineup! Soul Food Poetry Cafe's first event of 2019 - Soul Collective Volume I will be featuring several AMAZING poets and vocalists! Tia Pugh, Frank “Frizzy” Sykes, D’Essence, and Jeni Calhoun! Jermaine Johnson, Will B. Sings, Roni Sloss, Star Brooks, and Aundria Green! And we can’t have live music without the dynamic Craig Bailey & Friends! Tickets are a steal at $20 in advance (first come first seated in the main event hall) and $25 at the door! Don’t miss it! We have a very special show planned! Make this a classy girls night, pre-Valentines date with bae, or a time to hang with the fellas! Dress to impress – come camera ready! See you there!